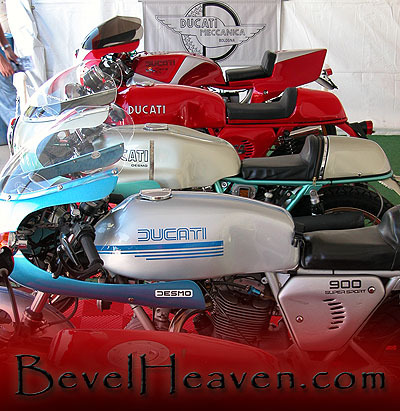 If you don't already know, http://www.BevelHeaven.com is a west coast USA source for vintage Ducati restoration parts and services. We ship worldwide to our customers. Please click the link above to go to our main website where you can choose to see our online virtual Ducati museum or to go directly to our secure, online storefront. If you would like to get an occasional email from us posting sale items & specials, new items found and in our store etc please sign up to be part of our eMail list. Click the link above, and fill out the basic form to be included. That's it. Easy. If at any time for any reason you wish to opt out, there is a link at the bottom of each email sent from us that you can click on to immediately be removed no matter what, no questions asked, no worries. You are in control. You will most likely get no more than a monthly eMail note pertaining ONLY to goods and services provided by BevelHeaven.com. You will NOT be spammed by our random opinons or rants, good or bad. Your email address will be protected from being viewed by those in the email list. Your eMail address will not be broadcast nor will it get used, sold or distributed in any manner other than to send you newsletters from BevelHeaven.com period.